E-Force Competition Air Intake System For 2005-09 Ford Mustang  : Supercharger Superstore, Your Online Source for Vortech Superchargers, Paxton Superchargers, Procharger Superchargers, Magnacharger Superchargers and Techco Superchargers! E-Force Competition Air Intake Systems include a high flow, 95mm Mass Airflow Sensor (MAFS) capable of supporting up to 90 lbs/min of air flow. It includes an 8" long, reusable, open element filter with plastic shroud. 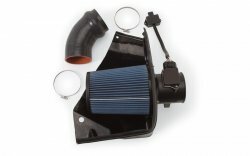 These systems are for use with Competition Supercharger kits only.